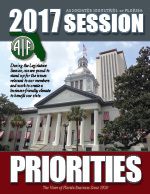 Tallahassee, Fla. – The Associated Industries of Florida (AIF) today released its “2017 Session Priorities” publication, which outlines its legislative agenda on behalf of its members for the 2017 Legislative Session. This year, AIF will lead the way for businesses through its councils and committees, including Builders & Developers Council; Environmental Sustainability & Agriculture Council; Florida Energy Council & Mineral Rights Working Group; Financial Services Council; Transportation & Maritime Council; IT Council: Manufacturing, Aerospace & Defense Council, Health Care Task Force; Taxation Committee; Workers’ Compensation Coalition; and H2O Coalition. “AIF stands ready to lead the business community on issues ranging from lowering increasing costs on business as it relates to workers’ compensation, opposing legislation making it more expensive for businesses to operate, such as prejudgment interest, and fighting to preserve the insurance premium tax salary credit, among others,” continued Feeney. AIF also expects to see numerous legislative proposals that revolve around Governor Rick Scott’s $83.5 billion budget proposal for FY 2017-18. The Governor’s proposed spending plan, which includes $618 million in tax cuts and $85 million for economic incentives to businesses, will go a long way in continuing to help the state achieve the prosperity and growth Florida’s families deserve. Once again, Florida leaders have an opportunity to elevate the state and make it the gold standard for 49 other states by adopting a budget that includes a pro-growth and pro-jobs tax cut agenda. One billion dollars in tax cuts will help accelerate job growth and prosperity for our state. “AIF congratulates Governor Scott and the Florida Legislature on making Florida one of the best places to do business in the United States. AIF looks forward to working diligently with our state’s leaders on these important issues during the 2017 Legislative Session, continuing our history of success that began in 1920,” concluded Feeney. AIF’s “2017 Session Priorities” publication is distributed to all 160 members of the Florida Legislature, the Florida Cabinet and Agency Secretaries, as well as AIF membership.